Monday night there were more chavistas on the San Felipe streets celebrating than what I ever saw during the campaign. Heck, Chavez had all the trouble in the world to get a turnout when he came to visit a week ago, but Monday night all of San Felipe seemed to be honking and chanting very vulgar themes based on the sexual implications of "10 millones por le buche". That Rosales won in San Felipe itself did not seem to have moved them much. I must confess that I was a little startled by that. Rosales had clearly shown that he had the enthusiasm of the campaign on his side. Chavez's meetings were drab, arranged affairs, filled with more buses than people sometime. And now they were all out? Did they go out to make sure they would be seen celebrating by the bosses, just in case they would be asked why is it that they did not attend such and such pre-electoral reunion? I am afraid that might be part of the answer. There is a whole population in Venezuela who work in service jobs or who have very vocal opposition bosses and who just prefer to stay quiet about their political preferences. Also there is such an image of violence and vulgarity associated with chavismo that many people just do not want to admit an attraction towards chavismo. Maybe I am wrong, maybe I am reading too much into it, but the opposition leadership might want to look into that a little bit better when it decides to establish its strategy for the future. 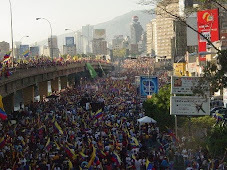 The fear factor might be simply admitting that one is chavista. How to settle the poll wars question? First a reminder: since 2004 Venezuela News and Views has eschewed any major discussion on polls considering that they are meaningless in Venezuelan politics. Only the trends from Keller & Co. were taken seriously. I think they all got it wrong. Those who interviewed in houses did a shoddy methodology and their predictions were proven right by luck more than by technology. Those who pretended to portray a fear factor in favor of Rosales got it wrong too, and might have lost all credibility for the future. I would very much like Keller to explain what happened… or consider another line of business such as polling for detergent brand name. In fact the only one who got it right was paradoxically Penn, Schoen and Berland . They got the normal advantage of Chavez, the one I predicted early in November (though I lowered it too much at the end, probably carried away by the emotion of the Caracas pro-Rosales Rally). What they got wrong was the fear factor and their prediction that most of the undecided would decant for Rosales. They did not, they decanted for Chavez. Thus Venezuelan politics keep sending folks to political graveyards, this time all the polls that tried to improve, at the end, Rosales chances. But if I were Zogby et al., I would not be celebrating too much: you might be the next ones to hit the dust. Chavez has made all of us, chavistas and anti-Chavez equally weary, equally unpredictable. One thing that is very worrying is that the result of yesterday clearly indicates that the country is more divided than ever, not only across political beliefs but across social lines, social groups. Positions are congealing and whole groups are now one side or the other. After a brutally violent campaign speech, people who voted for Chavez knew exactly what they were voting for: a rude, rough, mean regime which could easily fall into violent outbursts. There is no excuse: we were all informed and warned. How could people hold any doubt after the Ramirez famous PDVSA speech? Then it became clear that the only way to approach Chavez and the dollar manna was to dress in red and chant Uh-Ah! They also voted for incompetence, for neglect, for dirt on the streets, for deficient public services. So, who are these people that are so willing to drop civilized discourse, to live surrounded by grime, to subject themselves willingly to such an authoritarian display? It cannot be explained in a simple blog like this. But I still can try to give a short summary, kind of an anthropological-botanical catalogue. The numbers of each group are difficult to fathom, and the groups listed below can breed among themselves and form all sorts of subcategories. The reader will decide how un-P.C. s/he is willing to get as s/he keeps reading. Of course be warned that I am using very broad generalizations. This is the voter from the first hour, the one that Chavez gained first in 1998. He wants to get revenge against all the ills that society supposedly has bestowed on him. Nothing is her fault, it as always someone else's. It does not matter how long Chavez is in office, there will still be revenge to be exacted. Until suddenly, one day he realizes that Chavez is the one hurting him and then he will redirect the anger. This group used to be smaller than that, and in the past tended to be AD and to a much lesser measure COPEI. The left never managed to gain it completely since these type of people tend to look for a strong leader that will be able to effect that dream of revenge rather than any specific social change. Only Lusinchi and CAP managed to hold a good share of that group in the past. Causa R also got them for a while until Chavez finally got all of them for the first time. These people also used to be pro-army, pro dictatorship. Many supported Gomez or Perez Jimenez. This group has increased a lot in recent decades, and today the bulk is perhaps conformed of the sons and daughters of the massive immigration we got from Colombia, Ecuador, Peru and the Caribbean. The problem with that immigration is that it always had a sense of temporality because it came on foot and always thought it could go back home on foot. They never emigrated to Venezuela; they just came for a quick buck. But most stayed eventually and their kids grew in ghettoes without any particular attachment to Venezuela while their parents told them all the abuse they had to endure as immigrants. The result was only too predictable: Chavez is able at the same time to bring them revenge on the Venezuelan rich while making them finally Venezuelan. Amazing how psychology can work sometimes. Examples of "resentidos" are people such as Maduro, the current foreign minister. Or his wife, Cilia Flores now in charge of parliament. Jesse Chacon and Diosdado are also great examples of hate-filled "resentidos sociales". From the immigration theory, we can cite people like Tarek Saab, even though his family might have really emigrated to Venezuela. But we can also add the Tachira group of Iris Varela or Luis Tascon as Andeans sometimes feel more Colombian than Venezuelan or are treated unfairly as such in some circles. Varela confessed once that she had been tempted to join the FARC. In the original terminology the meaning is the leftist of the sixties and seventies, the one that has always been on the left because "it felt right", the one that never questioned if the model worked or not, because, well, it did not matter if it worked because it was the right thing to do. If this is mostly the support of Chavez overseas, it is not a negligible group for Chavez at home. They never were much more than 10% in Venezuela, usually identified with MAS or MIR, or independent movements such as MIN. And many of them did not follow Chavez after 2001. But the bulk is still with Chavez, willing to forgive all as long as it is for the just cause. However we must expand the definition of this group to include the naïve, and the ones waiting for the second coming which seems to be Chavez. These have no problem dressing in red and chanting because they now "belong". They are the enthusiasts who go to Mision Robinson to teach literacy even if the materials read like Cuban propaganda. They are the ones wearing Che Guevara T-shirts, thinking nothing of the crimes against humanity that this one pepetrated deliberately. We find them with people like Francisco Sesto at the Culture Ministry who thinks that changing the logo of all cultural institutions makes culture advance and become more accessible to people, who thinks that any cultural expression is equal to any other. We find them with people like Navarro or Urbaneja who never missed a Chavez rally and always looked at him with adoring eyes. Usually they are harmless; they try to do good and provide the cheering section that follows Chavez everywhere. But they can become very dangerous when crossbred with another group, the "resentido social". The mixed mental blood that comes out of that mix are people like Jorge Rodriguez who had no qualm in destroying Venezuelans' trust in elections. Or German Mundarain who gutted the Ombudsman office. This is possibly the largest group. This is the typical street smart Venezuelan who always tries to place himself where the money is good and easy to get, without much work or responsibility. They have been Adeco, Copeyano, back and forth, and now they are chavistas, even before 1992 they could be caught claiming. You do not find many of them in high positions because, justifiably, they are never to be trusted; but you find them. One was Roy Chaderton, former foreign minister. Others were seen during the constitutional process and are now enjoying the sinecure of some embassy somewhere. Many fill the benches of the National Assembly or the state legislatures. And of course the large cohort of boliburgueses ( a pun on Bolivar and Bourgeoisie) are getting all the juicy state contracts, the fabulous nouveau riche of the regime. Professional leeches…opportunists. The "vivo" can also become very dangerous when crossed with "resentido social". That breeds people who get to high office and are more than willing to do the dirty job of Chavez since, simply put, they have very little ethic and principles. You find such examples with Carlos Escarra who failed to be chosen by Chavez for anything until 2004 and who now is a TSJ judge and one of the worst Talibans of the group, trying to erase his "vivo" image by being more chavista than Chavez, an ultimate hard line "vivo". Long term serving Christina Iglesias can also be put into that group: she went from assistant of AD senator Paulina Gamus, to hatchet woman at Labor. Unfortunately for Chavez, this group is the most difficult to keep. He almost lost them in 2002, but recovered all of them when oil prices went above 40 USD a barrel. Now they are the ones that have been successfully bought with the promise of a Mision, any meager handout, or some public servant job. There is a fourth category that we could call the " flojo", the lazy one. This category could almost be classified as "vivo" except that the "vivo" adapts and the "flojo" prefers not to, a major difference in revolutionary times! Elides Rojas in a rather bitter OpEd piece today described them very well, these people who have stopped caring, who do not mind the disastrous streets of downtown Caracas, crime, insecurity. People who are now too lazy to fight back, too lazy to defend their business and who actually voted conservatively for Chavez because, well, they got used to the mess and they rather have everything as it is. They do not deal well with change, they are too afraid of social disorder if Chavez loses office. They feared that chavistas in Catia would ransack their little bodega. You do not find many of these in power; they are loath to take risks, to climb, but you find them too. They are the public servant who was AD, then Copei and now MVR. They are those who are only too willing to attach themselves behind an entrepreneur "vivo" to do the real work while the "vivo" flashes his new wealth around. You can also find them in high office, very high actually. The two Rangels, VP and Petare Mayor can be placed into that group. They got a position, they are bad at it but they excel at keeping it, at bending backward to keep it, to make sure nothing changes, nothing new happens, nothing gets destroyed. They are in fact the most reactionary members of the regime. The genius of Chavez is that for the first time ever someone is able to tie together these four groups, and even to manage to increase them through his rhetoric: "come flores" find it normal that Chavez gives money away to poor people elsewhere even if we have boatloads of poor people at home; " resentidos sociales" do not mind giving oil to Boston because it pisses off the US establishment; "vivos" think that they might get a contract to transfer the goods that Chavez is giving away and "flojos" could not care less as long as they keep receiving their dues. PS: I really want to stress that this does not mean that I consider all chavista voters jerks that sold themselves out. Not at all. At least in the "come flor" section there are many nice and good people that for some strange reason believe naively that Chavez is a good man, that he cares about them. So be it. But it is also fair to say that too many of the "resentidos" and "vivos" are bad news. Also, if you think that I have been harsh on the chavista voter, wait until I get to the opposition voter.